Akhilesh Yadav today retorted to Prime Minister Narendra Modi's remark that the Uttar Pradesh Chief Minister fears he might be blown off in BJP's storm. 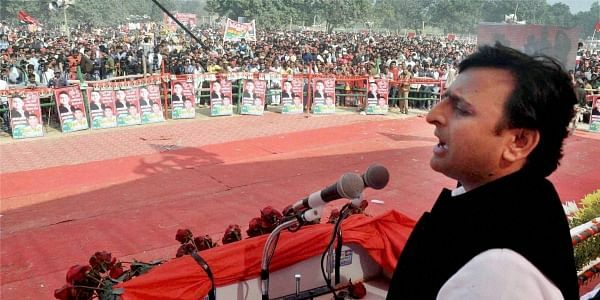 SITAPUR: Akhilesh Yadav today retorted to Prime Minister Narendra Modi's remark that the Uttar Pradesh Chief Minister fears he might be blown off in BJP's storm wittingly, saying the Samajwadis know how to ride a "cycle against the wind". "The Prime Minister is saying there is a storm of BJP but we Samajwadis know how to ride a cycle against the wind," he said at a rally here. Modi had in Aligarh yesterday said: "And when the wind is so strong, even a young leader cannot face it and seeks help of anything ...even a pole...but this time BJP 'aandhi' (storm) is so strong that the Chief Minister fears that he might be blown off... The people of UP want change and justice." Yadav, who was in Sitapur to address a series of poll rallies, listed the achievements of his government and said that more development will take place if SP returned to power. Attacking BJP, he said: "This party made people stand in queues outside banks ... Many poor people lost their lives but BJP did not come to their rescue. It was the SP government that announced a financial aid of Rs 2 lakhs for the families of such people. "No one got Rs 15 lakh after all the money was deposited into bank accounts (during the demonetisation drive). Now, they are not telling us how much black money... how much ill-gotten money is there." On the SP-Congress poll alliance, the chief minister said it "accelerated the pace of SP's cycle... We did not act like a miser friend. We gave a good number of seats to Congress."